From Bandai! Bandai Candy Toy is proud to introduce the 17th installment of the widely popular FW Gundam Converge series. The figures are approximately 2 1/4' tall with a uniquely deformed look while retaining stylish proportion. 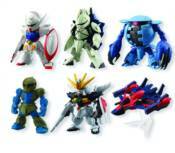 This series includes Turn A Gundam, Turn X Gundam, Gundam Double X, G Falcon, Capule, and Zaku I. Two of these included characters are secret versions! Note: Bandai Shokugan products sold by Bluefin will not have candy.